If you have excess skin and fat (usually a result from multiple pregnancies or weight loss) that you'd like removed for a flatter abdomen, you may want to consider a plastic surgery procedure called a tummy tuck or abdominoplasty. A tummy tuck restores a fit and youthful appearance to the abdomen. How does a tummy tuck work? With this cosmetic surgery procedure, a horizontal incision is made in the pubic hairline. Then, excess skin and fat can be removed and weak abdominal muscles can be tightened. The length of the scar depends on the amount of excess skin that needs to be removed. A mini tummy tuck surgery requires a smaller scar and is ideal for patients who have muscles weakness and excess tissue below the navel only. During a consultation, the correct cosmetic surgery procedure for each individual patient can be discussed. Healing from a tummy tuck occurs over a 2-4 week period and the incision scar will typically fade over a one-year period. 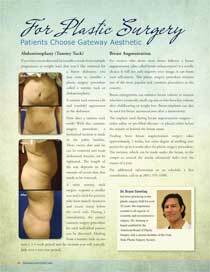 Remember, for abdominoplasty (Tummy Tuck), Salt Lake City patients choose Gateway Aesthetic. Give us a call to schedule a consultation with Dr. Bryan V. Sonntag, 801-595-1600.